Disclaimer: This post may contain affiliate links, which means I receive a percentage of the sale if you make a purchase using my link, but your price is not increased to compensate for this percentage. Are you a prepper? Usually that title means someone who believes wholeheartedly that a catastrophic event is imminent and so they are stockpiling supplies like food and ammunition. I'm not here to defend or belittle preppers; I'm just saying they are out there and they are usually very organized and very intentional. There are certainly varying levels of preppers, from those who could survive for a few days to those who could live for years in their underground bunker until the nuked air was safe to breathe again. In our household, I'd say we're in the first category. We were given 72-Hour Emergency Bags a few years ago for Christmas and we've kept the things in it fairly up-to-date. We have a few books on survival and what to do in various emergency situations, which I should actually read before disaster strikes... I'll probably even do a series of blogs on getting prepared for disaster, but I'd like to approach it from a prayerful attitude that includes consideration for our neighbors and family, as well. I'm starting really small and invite you to do the same! My first step in getting prepared was to create a DIY Portable First Aid Kit. My intention is to keep this in the car so that we have it with us out and about and also on longer trips. Here are the details so you can build your own, if you choose. I started doing some research on what's out there in the world of first aid kits. I looked online and in stores and of course, on Pinterest. In the end, I decided that in order to get exactly what I wanted and needed in a first aid kit for our family, I would make my own. There are a ton of great ones out there, but I already had some supplies on hand, so I didn't want to spend money on stuff I already had. And some of them had items I knew I would never use, so again I opted to save my pennies and include only things we found useful. DIY it is! Now what? Pinterest, of course! As was expected, I was not the first to make my own first aid kit! And man, was there a lot of variety! People in Pinterest-land have made first aid kits in everything from Altoid tins to lunch boxes to ammunition canisters to tackle boxes. Side note: I made mini first aid kits in Altoid tins for a group of friends heading out on a mission trip! With a few bandaids, some individual antibiotic ointments, hand-sanitizing wipes, Pepto Bismol tabs, and pain killers. I added in ear plugs (to help with sleeping in a new place) and Vitamin C powder (to build the immune system after travel). It was a big hit in a tiny package! From my research, I compiled a basic list of what I wanted in my kit. 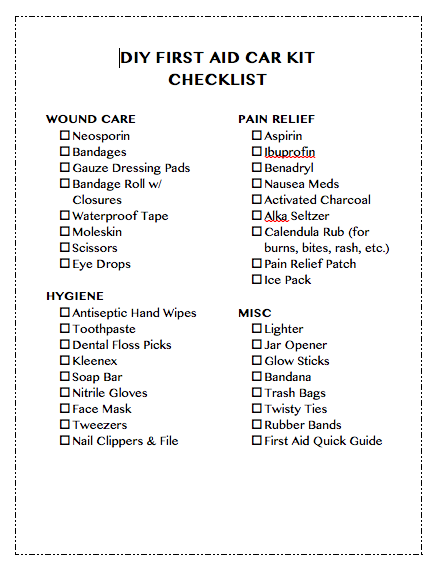 I then took stock of the first aid supplies I already had on hand, gathered them in one place, and them off the list. Next stop was the Dollar Tree. They have a decent selection of first aid items and this is where I found my tiny pill holder, amongst other things. After that, there were just a few odds and ends that I still needed, but a quick trip to Walmart took care of those items. Want a printable version of my final list? Fill out the form at the bottom of this post and it's all yours! For an organizing nerd like me, this was truly the fun part. In fact, I had it all put together when I realized I wanted to write this DIY post about it. I was so excited to take it all out again so I could reorganize it again... I've been told it's a sickness. I think it's awesomeness. Keep an up-to-date inventory. Your list should include not just what is in your kit, but how many of each item is in there. Make note of expiration dates for ointments, creams, and medications. Check this regularly and replace expired items. Laminate the list so that you can easily change the numbers on the list without it looking messy with scratch-outs. This also makes your list water resistant and therefore allows you to attach it to the outside of your kit. Do you have a First Aid Kit in your car? What did I leave out that you included in your kit? What are some cool items you think are very helpful? When has your First Aid Kit really saved the day? Success! Now check your email to get the goods.